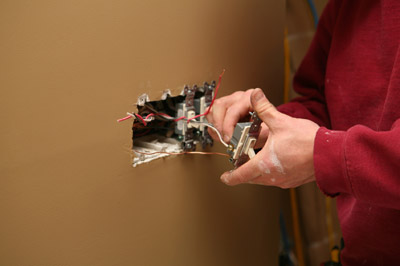 from installing additional sockets or lighting to a complete house rewire. We are established electrical contractors based in Barnsley. As well as domestic wiring, we install and maintain commercial electrical systems for schools, hospitals, churches, shops, warehouses and offices. We regularly work with Local Authorities and Housing Associations on new builds and rewires, and take pride in getting the job done quickly, thoroughly, and at a very competitive price. Our services include: Electrical installs in new build houses and flats, House rewires, Electrical refurbishments, Wiring for extensions and garages, Designer lighting installation, Fire alarms & intruder alarms, Exterior cabling, outside sockets & lighting, Security lighting, PAT testing (Portable Appliance Testing), Hard wire periodic inspection & testing, and much more. For further details or a FREE quotation click here.